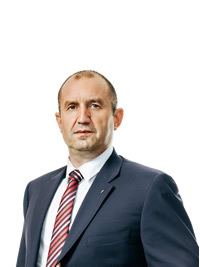 Rumen Radev is the fifth democratically elected President of the Republic of Bulgaria. He was born on 18 June 1963 in Dimitrovgrad. He graduated from the High School of Mathematics in Haskovo with a gold medal in 1982. Rumen Radev took his University Degree at the Air Force Academy in Dolna Mitropolia as the top graduate. In 1992 he successfully completed the Air Force Squadron Officer School, Maxwell AFB, USA. From 1994 to 1996 Rumen Radev attended the Command and Staff College – G.S.Rakovski National Defence Academy, Bulgaria, and graduated as the top graduate. In 2000 Rumen Radev was awarded PhD in Military Science, majoring in ‘Enhancing the Tactical Training of Aircrews and Air Combat Simulations’. In 2003 Rumen Radev completed the Air War College, Maxwell AFB, USA, as a distinguished graduate and took Master’s Degree in ‘Strategic Studies’. His name is written on the Glory Alley of the Air War College. Rumen Radev is a First Class pilot with more than 1400 flight hours. He is a MiG-29 Instructor and Demo-pilot and was promoted a Major General. During 2014-2016 Rumen Radev was Commander of the Bulgarian Air Force. In November 2016 Rumen Radev was elected President of the Republic of Bulgaria in direct elections, gaining over 60% support of the Bulgarian voters. He is fluent in English, German and Russian language.